The most interesting way to travel in Bangladesh is by cycle rickshaw. Dhaka is known as the ‘rickshaw capital of the world’ and the drivers (pedallers?) are known as riksha-wala (রিকশাওয়ালা). I consider it “peoples’ art”. It is not necessary to force it into a unitary category as it combines folkloric, movie, political and commercial imagery and techniques. It serves the expression of heart’s desires of the man in the street for women, power, wealth, as well as for religious devotion. Rickshaw art also serves prestige and economic functions for the people who make, use and enjoy it. 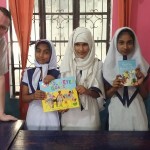 Here is a thirty second video sequence I took on Wednesday afternoon – the edited highlights of a journey from the International School of Dakar to the Royal Park Hotel near Banani bridge. 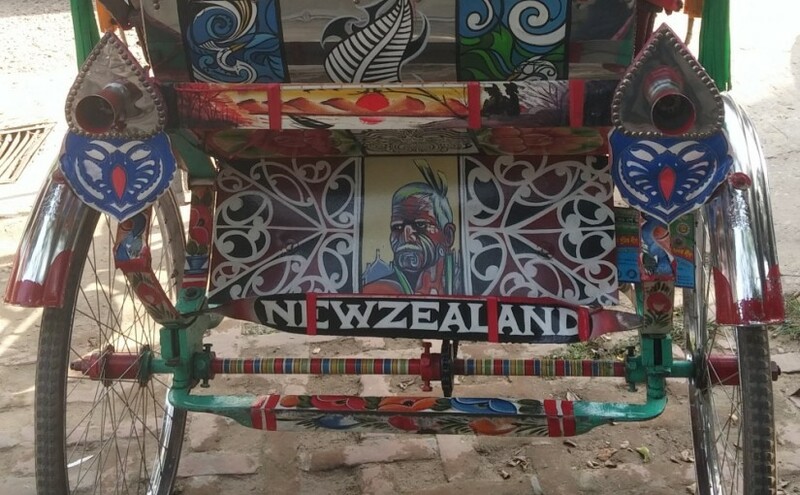 My ricksha-wala ‘Geniral’ was given his rickshaw by a New Zealander living in Dhaka – hence the Kiwi themed rickshaw art!